File photo of INPT activists staging protest in Agartala demanding NRC. After ruling alliance IPFT, another tribal party of the opposition INPT demonstrated in Agartala in demand of introduction of NRC and withdrawal of Citizen Amendment Bill, 2016. 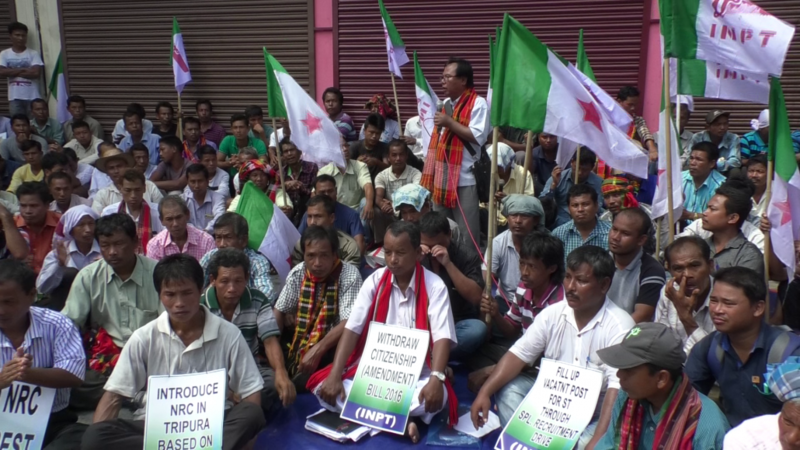 Hundreds of agitators assembled outside the Vivekananda stadium and sat on a demonstration demanding the introduction of NRC in Tripura to filter out the foreigners especially Bangladeshi nationals due to which the indigenous people have become a minority. They raised slogans with posters for NRC in the state like Assam to weed out illegal migrants which have transformed the indigenous people into a minority over the years. Bijoy Kumar Hrangkhawl, a militant leader who has made a successful transition as a politician and later became a member of the Tripura Legislative Assembly, has demanded introduction ofNRC. In support of their demand Bijoy Kumar Hrangkhawl, president of Indigenous Nationalist Party of Twipra, said that the apex court directed the Centre to finalise the modalities since the NRC will form the basis for the detection of illegal immigrants, inclusion will be a shield against harassment and a ticket to enjoying all the constitutional rights and safeguards and the benefits of government schemes. Ever since the final draft of Assam’s NRC was published on last Monday, several people across the country have come forward making similar demands for their respective states. He viewed that the Centre should sort out the issue of ‘illegal Bangladeshi infiltrators in the region’. Similar has been the view of IPFT general secretary Jagadish Debbarma. Chief Minister Biplab Kumar Deb had declined introduction of NRC in the state saying there is no demand or necessity for NRC in Tripura.